Two weeks ago I introduced a method to calculate the area of a batter’s swing zone, which you can view here. I created the stat because O-swing—the percentage of swings on pitches outside the strike zone—is so… unsatisfying. O-swing gives us no information about how far a batter is chasing. Swing area, on the other hand, can tell us in easily understandable terms how large a batter’s swing zone is. A more detailed explanation is given in the article, but I calculate swing area by finding the area of the 22.4 percent swing contour. While analysis of swing variance yielded intriguing results, swing area proved to be somewhat disappointing as a measure of plate discipline. For batters it measures the same skill as O-swing, and does not do a better job than O-swing of predicting walk rates. Thanks again to Lucas Apostoleris for coming up with the idea to perform this kind of analysis. But what if we apply this analysis to pitchers? See that long tail on the right side of the graph? That tells us that the distribution is skewed positively, which is something to keep in mind later when we look at the relationships between various plate discipline metrics and strikeout rate. I should also note that, for the sake of transparency, I have slightly tweaked my calculation since I introduced it; I increased the number of bins that I was using, making the calculation a little more accurate. A major surprise at the top of the list is Carlos Carrasco. His placing is surprising because he neither records a lot of strikeouts nor is rated well by O-swing. He may be a good example of some of the limitations of this calculation method—I found a decent amount of his pitches that were clearly PITCHf/x errors in my data base. Not enough errors that we need to be very worried about the integrity of the data, but enough that we need to be mindful of the problem. Roy Halladay had the seventh largest swing area. The top five here are far less surprising. I wasn’t quite sure what group to put Luebke in as he started the year and finished as a starter, but most of his appearances came as a reliever so I that’s where I kept him. 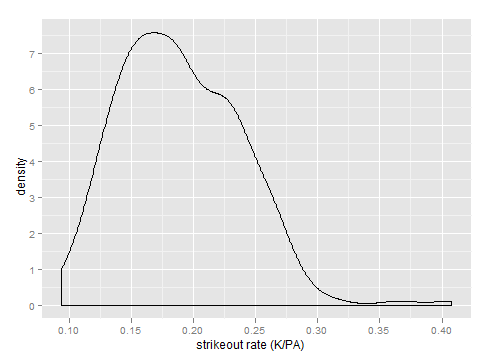 The distribution suffers from the same skewness as the distribution of strikeout rates. This has the unfortunate effect of making it difficult to measure the center and spread of the distribution. In cases like this mean and standard deviation do not do such a great job of describing the distribution, so we should use other methods. 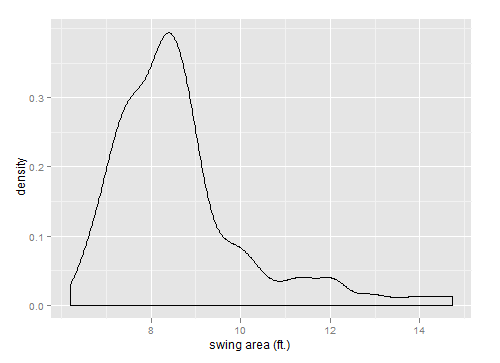 The median swing area is 8.3 feet, and the first quartile—the 25th percentile—is 7.6 feet. The third quartile—the 75th percentile—is nine feet. Much less skewness was present with hitters. The relationship is much weaker than expected. This suggest that there may be a difference between the ability to get batters to chase outside the zone and the ability to get batters to chase far outside the zone. With hitters we found no evidence for two separate skills. But which metric, O-swing or swing area, tells us more about a pitcher’s strikeout rate? 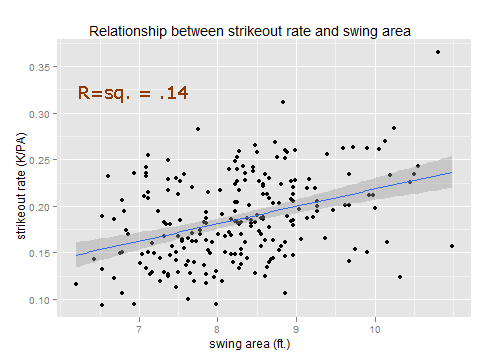 After again removing removing outliers (swing areas > 11), we find a correlation of .376 between swing area and strikeout rate, with swing area being significant at greater than a 99 percent level. The coefficient of swing area is .019. 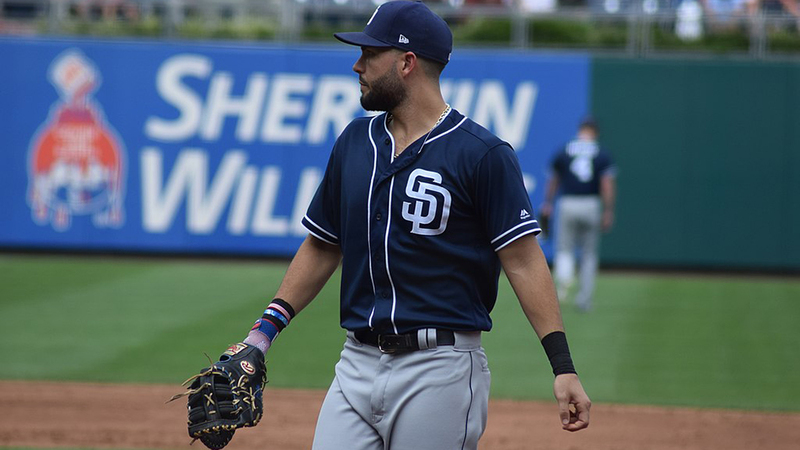 This means that for every increase in the values of swing area by one, we can expect a corresponding increase in strikeout rate by a little less than two percent. The R-squared is .14, meaning that the values of swing area explain 14 percent of the variation in strikeout rate. O-swing explains just 2.4 percent of the variation in strikeout rate, which is lower than expected. O-swing is also statistically significant, with a p-value of .01 (for a two-sided test). I also tested these two metrics with a measure of overall ability, in this case FIP. 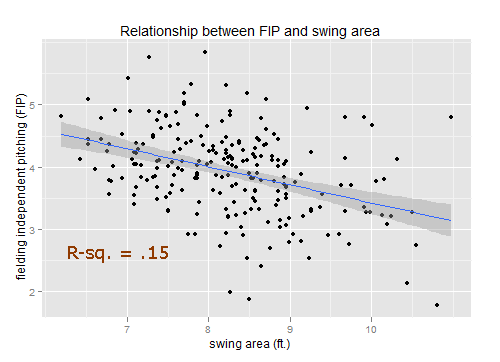 Both variables have a significant relationship with FIP, but swing area explains 15 percent of variation while O-swing explains a little less than three percent. Both coefficients are negative, meaning that there is a negative relationship between both variables and FIP, which is to be expected—the more you can get a batter to chase, the better of a pitcher you are. The coefficient of swing area is -.29. This means that for every one foot increase in swing area, we can expect FIP to decrease by .29. I also tested both O-swing and swing area with BABIP, and neither were close to significance. This is important because often we attribute a pitcher’s ability to induce weak contact to be in part their ability to get a batter to chase, but there is no evidence of this relationship. Swing area tells us much more about both a pitcher’s overall ability and more specific ability to record strikeouts than O-swing does. It seems that how far the batter is chasing does contain valuable information, and that O-swing may not be so useful for evaluating pitchers—it neither tells us much about strikeout rate nor BABIP ability. But why is that swing area is so much more important for pitchers than hitters? I’ll expand on the explanation that I’m working on in a later post. Excellent stuff, Josh! This looks like a very useful tool for pitchers. Thanks, too, for the data. PS – I did notice that you restricted the sample size, so maybe it’s less of an issue. 1,000 pitches can sometimes still be small, but probably sufficient for this purpose. Are you cross validating your smoothing parameter for each individual pitcher? Excellent work, Josh, as always. 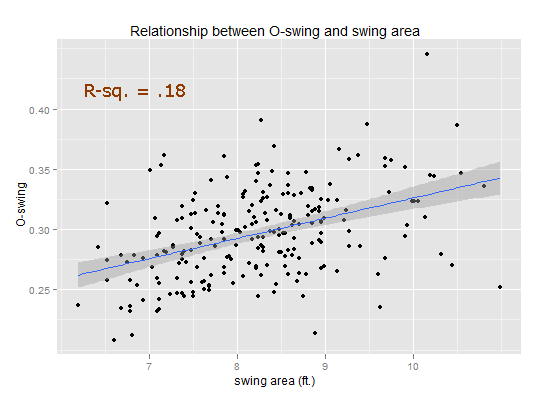 “just right” parameters for logistic regression models, and not sure how that would apply for Josh’s swing area models here, but deciding how to cross validate each set of data and identifying the right smoothing parameter can improve the results. I’ve worked with some machine learning algorithms in R (namely, Random Forests). However, mgcv (as Josh says above) is probably the best bet. Was just checking that out. As for how big of a problem, I think restricting it to no less than 1000 pitches and using the Gaussian link (rather than binomial) makes the computation a bit safer. I think it’s a great application. Out of curiosity, I’d be interested to see if players’ rate of change in swing area across contour. Are these relatively constant across players? PS – Really cool, and given the results, it seems to be a totally reasonable use of the methods! I did actually use the logit link, and not the gaussian link. I am also not entirely sure what you mean by rate of change in swing area across contour. It would be interesting to see the interaction between pitcher swing area and hitter swing area. How do pitchers in the top quartile (highest swing area) do against hitters in the top quartile (lowest swing area)? Are the great pitchers making all hitters chase a little bit more than they otherwise would, or are they just making the worst hitters chase farther away than other pitchers are willing to try? Very nice work Josh! Very nice indeed! And Bill, I agree, that’s definitely something worth looking into.